The port of Hong Kong, located by the South China Sea, is a deepwater seaport dominated by trade in containerised manufactured products, and to a lesser extent raw materials and passengers. A key factor in the economic development of Hong Kong, the natural shelter and deep waters of Victoria Harbour provide ideal conditions for berthing and handling all types of vessels. It is one of the busiest ports in the world, in the three categories of shipping movements, cargo handled and passengers carried. Hong Kong's container port currently has eight container terminals consisting of 18 berths, with an average of 11.5 million TEUs (20-ft equivalent units) throughput capacity per year. 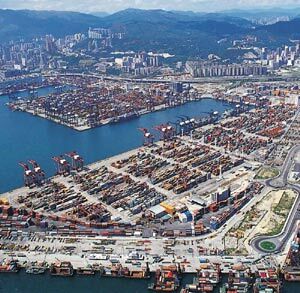 The port's impressive efficiency and capacity has won Hong Kong the title as the busiest container port in the world for five consecutive years.